FleishmanHillard’s CSR practice helps clients seize the opportunities that flow from being a socially engaged and sustainable business. 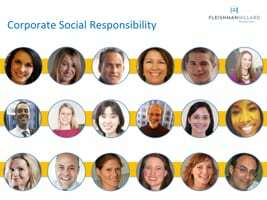 While the agency has been communicating clients’ social, environmental and financial leadership for decades, in 2007, FleishmanHillard became one of the first major PR firms to formalize a CSR practice, now one of the fastest-growing disciplines in the agency. In 2013, as part of a commitment to stay at the leading edge of CSR communications, FleishmanHillard’s counselors were among the first in the United States to complete certified training in the new Global Reporting Initiative G4 Sustainability Reporting Guidelines. FleishmanHillard's methodology delivers CSR solutions grounded in an understanding of clients’ core businesses and the audiences who matter most: customers, current and prospective employees, investors, nongovernmental organizations, legislators/regulators, communities, business partners and news media. It’s a systematic approach that enables the practice to uncover and leverage opportunities and mitigate risks throughout the value chain. FleishmanHillard has an active voice in the CSR and sustainability conversation with the goal of advancing state-of-the-art thinking and sharing best practices. In the last few years, its counselors have spoken at leading industry forums, including the Global Reporting Initiative (GRI) USA Conference, Net Impact, the Green Initiatives Conference and the Public Relations Student Society of America (PRSSA) National Conference. The agency works with clients worldwide to deliver programs and strategies that support their core business and strengthen their brand, including AT&T, Tyson Foods, Visa, Chobani and Safeway.